Cypher2, the cutting-edge software synth from ROLI and FXpansion, was released in August 2018. The FXpansion team, led by Angus Hewlett (standing, center) launch DCAM Synth Squad in 2009. After three years, tens of thousands of lines of code, long days, late nights, 200 unique test systems and almost 100 kg of premium espresso beans, Cypher2 is finally here. Cypher2 is simply the most powerful MPE-enabled synthesizer ever made. It builds on the original Cypher that was a pillar of DCAM Synth Squad, FXpansion’s package of synths released 2009 (could that really have been 10 years ago?). And it continues the tradition of sound design exploration at FXpansion, the company I co-founded at the turn of the millennium. At the end of this piece I’ve listed the things that set Cypher2 apart from other synths, starting with its TransMod system. Now that it’s released, it’s also remarkable to look back on Cypher and Cypher2 as bookends of the story of MIDI Polyphonic Expression (MPE), the cross-industry movement toward more expressivity in electronic music making. MPE was not yet a thing in 2009. But people were working on projects that would soon coalesce. One was a sound designer who went by the alias “Himalaya.” He reached out shortly after the launch of Synth Squad, saying he wanted to make sound packs for Cypher that would recreate the sounds of legendary synths from the ‘70s and ‘80s. We bonded over a shared appreciation of Yamaha’s SY-77, a one-of-a-kind sampling/FM hybrid synth that inspired both of our early dabblings in synthesis. The early prototypes of ROLI's Seaboard GRAND were powered by a customized version of FXpansion's DCAM Synth Squad, built by Angus Hewlett and Rafael Szaban. Another of these proto-MPE pioneers was a designer at London’s Royal College of Art. At the time, FXpansion worked with a PhD researcher who brought some academic wizardry to the beat-slicing algorithms of Geist, another FXpansion synth. Through him we learned of this mysterious industrial designer with a “top secret” project. The designer was Roland Lamb. His project was the Seaboard — or rather, a very early prototype of it — and he had just founded ROLI. Fast-forward to 2012, when the Seaboard was nearing its commercial launch. It was a brand new instrument, and nobody really knew how it should sound. Few sound engines could cope with the depth and range of MIDI data that the Seaboard interface generated, let alone create sounds that were musical. This seemed like a job for Himalaya, who by that stage had worked on a few collaborations with FXpansion. Himalaya and I customized a build of Synth Squad that supported Multi Dimensional Control or MDC — the forerunner to MPE. 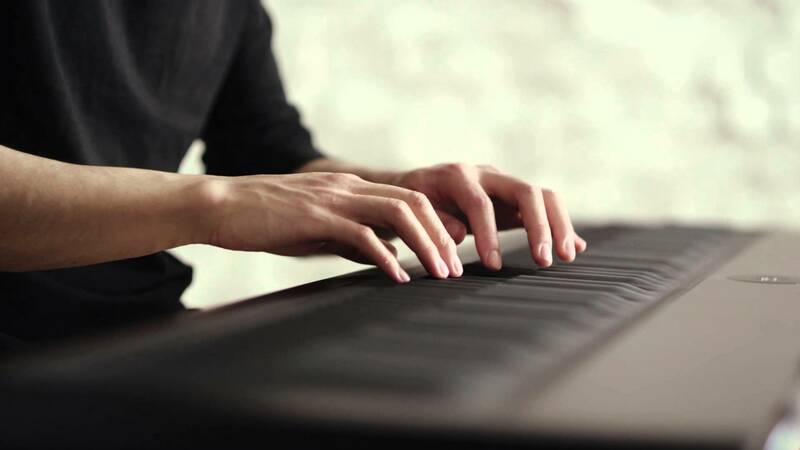 ROLI used this build to demonstrate the pre-production Seaboard, and everyone who heard these demos also heard the immense potential of the instrument. 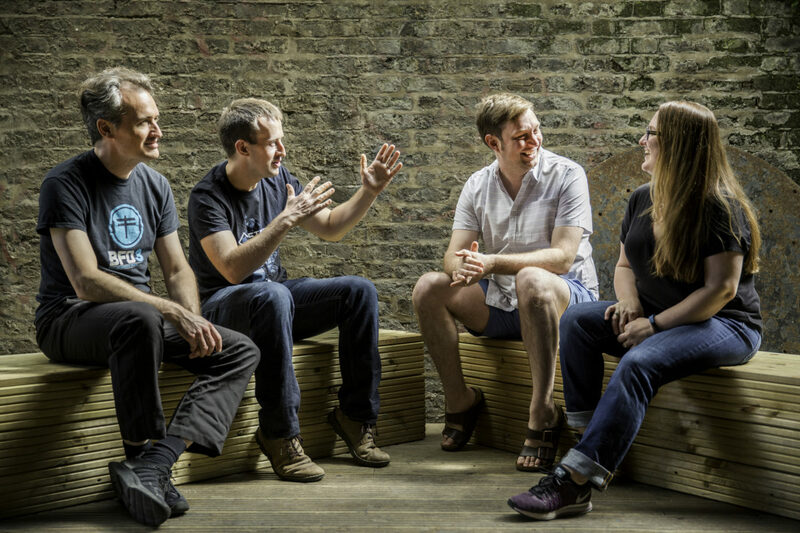 FXpansion's SKoT MacDonald (left), Angus Hewlett (center left), and Rhiannon McLaren (right) meet with Roland Lamb (center right), ROLI founder and CEO. ROLI acquired FXpansion in 2016 to develop new 5D sounds and MPE software. The rest, as they say, is history. Himalaya, aka Rafael Szaban, is the lead sound designer at ROLI and is probably the most experienced MPE sound designer in the world. ROLI acquired FXpansion in 2016, and the team and I are now helping to create the next generation of ROLI products. Over the past two years we’ve spent many hours immersed in the intricacies of “5D” sound synthesis. This is about more than implementing the new MPE protocol. Anyone with a JUCE license and a rudimentary knowledge of software synth development can do that. The challenge is making 5D sounds behave smoothly, believably and above all musically. With its bank of 500 5D presets, Cypher2 is the most advanced software synthesizer for MPE-enabled sound design. We’re especially proud of this, given that its predecessor Cypher started life during the earliest glimmerings of the MPE era. Synth designers, like the makers of any creative tool, can never anticipate all the ways that people use the instruments they create. Much as we know that their purpose is to allow expression and creativity, people will find things in them that you didn’t know were there. Roger Linn and Kikumoto-san (principal inventor of the TR-808 boxes) never imagined their creations becoming the foundations of hip hop or acid house. Dave Smith couldn’t have foreseen in 1983 that MIDI would find a home in multiple billions of devices. On the Cypher2 project I’ve stayed on the coding side and left the sound design to others of Himalayan capabilities like Rafael. They’ve created presets from this synth engine that I would never have imagined. Cypher2 comes with 1300 sounds, including 500 5D presets — the largest library of MPE sounds ever. “Preset,” however, is not really the right word for these MPE-enabled sounds. Like Kontakt scripts, they're not far off being software programs in their own right. This creates a whole additional layer of emergent behaviour. Just as I can’t anticipate what the sound designer will create with the synth engine, there’s no way of knowing what music will emerge when people start exploring these newly dimensional sounds. I expect the results will be very powerful, especially when people explore the sounds on an MPE controller like the Seaboard Block. There are 1300 presets in Cypher2: 800 “2D” designed for conventional MIDI controllers (each with three additional degrees of freedom thanks to carefully mapped macro controls), and 500 5D designed for expressive controllers. Start exploring them yourself! Angus Hewlett is VP of Engineering, Research, and Technology at ROLI. He is founder and former CEO of FXpansion. 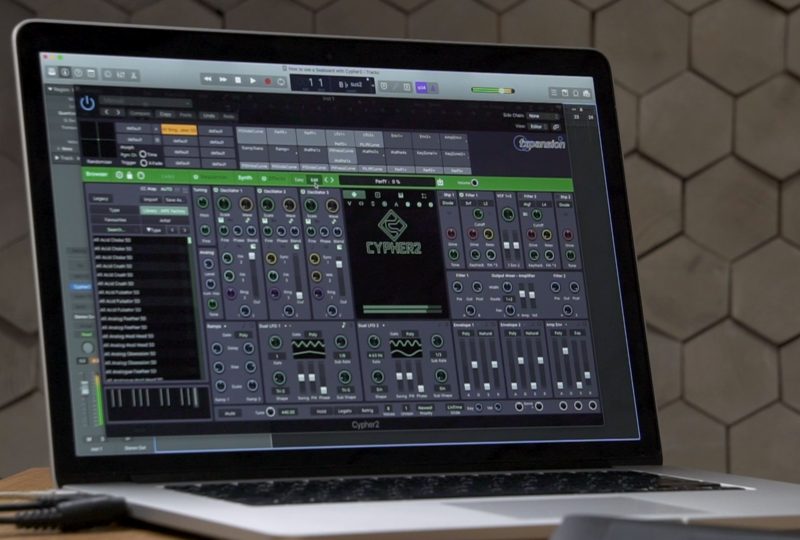 Cypher2 features include an intuitive TransMod system, a complex sequencer/arpeggiator and a powerful FX engine. A far more intuitive TransMod with three times as many Mod Slots, dozens of new sources and all manner of real-time monitoring to help you navigate the system. A fully scalable vector-based GUI with color themes for every taste and lighting environment. The same circuit modelled filters, plus four brand new models. The most capable sequencer / arpeggiator we've ever shipped. Switchable tri / sin core oscillators with additional audio-rate modulation paths for more complex, dynamic timbres. New polyphonic distortion and waveshaping modules including wavefolders, all modulatable in real time. Spline Curves, Maths Modules, X/Y, slew generators, keyzones and a raft of Euro-inspired modulation tweaks. LFOs with multiple phase outputs and sub-oscillators, envelopes with four simultaneous curves and dual looping ramps. A poly audio routing subsystem that lets you apply different FX mixes to different oscillators, different parts of the keyboard, different bits of the frequency spectrum or even the attack and release phase of the same sound. Assignable, flexible MPE controllers to enable full expressive playing from ROLI Seaboards, BLOCKs and MPE-compatible instruments from other vendors. Download Cypher2 and learn more on FXpansion.com.